The Parable of the Sower – Rocky ground, thorns and good soil. We all have time with rocky ground, thorns and good soil. I would like to tell you about my garden. Living in a new house for nearly a year now, and builders are great but they are not gardeners! The garden is, well let’s say it’s getting there! On visits and walks in this village and other villages I see gardens of all sorts. There are those where everything seems to remain in neat and tidy order all the time. How does that work? I’m never really sure how that can happen? And then there are gardens where disorder has taken over completely, it could be in design, or not sure how to make a garden, or that life has become hard and the long worked over garden has just got out of control. And then there are gardens where plants are purchased from the garden centre at least twice a year and order is restored, or the gardens where shrubs and everlasting plants are intertwined with gravel paths and maintenance is very low, but the effect is okay, nothing needed to be done. And finally the garden where children’s games and toys are everywhere, plants are battling with the Buzz Light Year toy in the shrubs or tennis balls and footballs long ago punctured scattered across the garden. A grass lawn is usually there too, but with patches and areas where too many ball games have even worn down the grass. The Parable of the Sower is a bit like modern day gardens. Jesus tells the story of how and where God can find his word present and alive. Jesus used parables as a way to explain the unexplainable, to give a picture in people’s minds of how God can be alive in everyone and how sometimes we are all a little deaf to His voice. 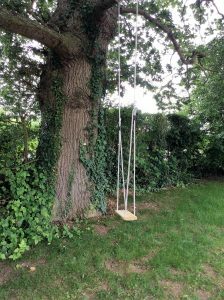 PS The swing is very important for daily reflection… and for looking over the hedge! This entry was posted in Faith goes walkabout, Sermons, Trinity, Uncategorized and tagged faithgoeswalkabout, gayton group of parishes, norwich diocese. Bookmark the permalink.